NAWIC Columbia, SC, Chapter #113 will hold their monthly member meeting on Tuesday, October 4, 2016, at 6:00 PM at Mashburn Construction, 1820 Sumter Street, Columbia, SC. Please join us as we welcome Samantha Ericson Turner, the Workforce Development Manager with Midlands Education and Business Alliance (MEBA). Samantha will be discussing workforce shortages in our industries and what some of the local community leaders are trying to do to help. 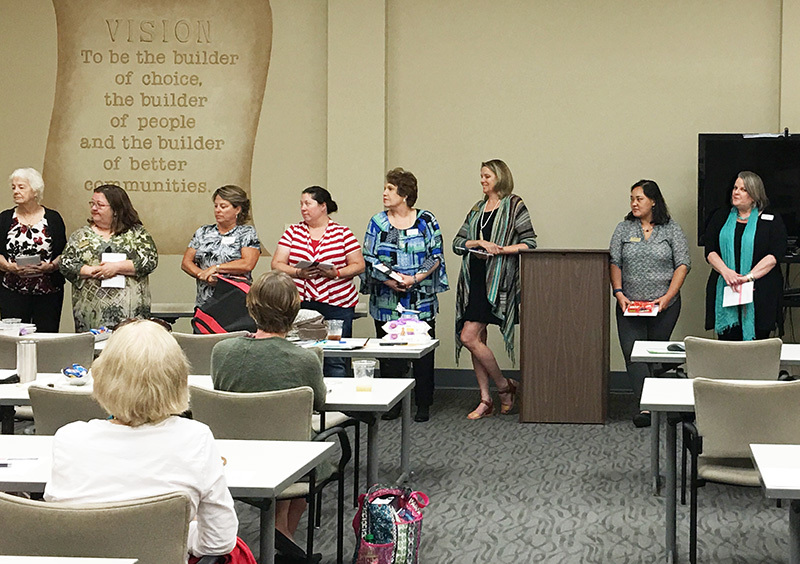 The Columbia, SC, NAWIC Chapter #113 inducted their Officers for the 2016-2017 term. 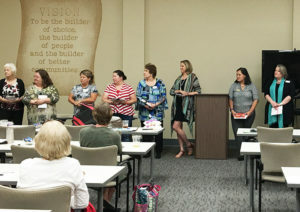 Pictured (from left) Parliamentarian, Linda Schilling of Walker White, Inc.; Immediate Past-President 2015-2016, Debbie Edwards of Premier Lighting and Control; Treasurer, Melba Cannon of Swann Associates Inc.; Corresponding Secretary, Susan Jennings of Specialty Woodworks; Recording Secretary, Sheila Nelson of McCrory Construction; Vice President, Susan Clary of Contract Construction, Inc.; President-Elect, Coral Brandt of Jumper Carter Sease Architects; and President, Darla Moore of Hood Construction. NAWIC Columbia, SC, Chapter #113 inducted the 2016-2017 Board of Directors at the member meeting held on Tuesday, September 6, 2016, at 6:00 PM. Pictured (from left) Immediate Past-President (2014-2015), Janet Lehman of Jumper Carter Sease; Board Members Adair Stevenson of ESP Associates, P.A. 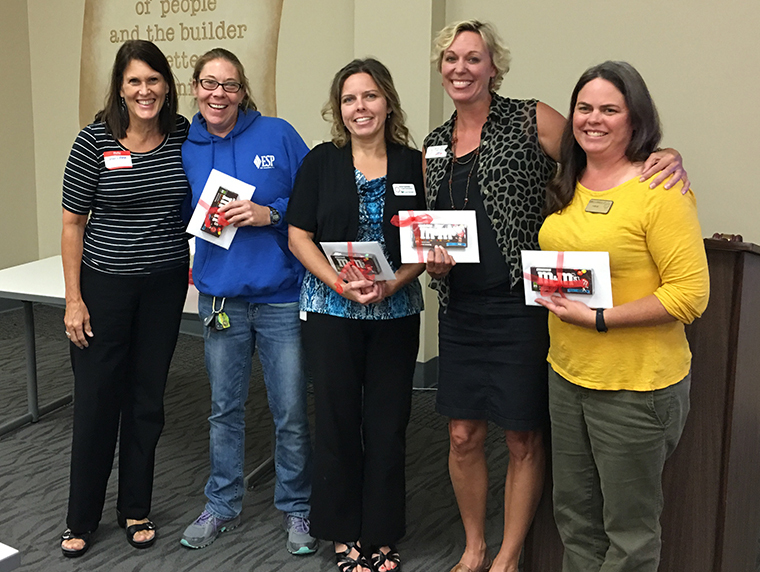 ; Nichole Kopenhaver of McCrory Construction; Dana Jacobs of Sign-it-Quick; and Rebecca Connelly of OLH, Inc. The Board of Directors will take their turn on the board starting October 1, 2016. Adair Stevenson, Nichole Kopenhaver and Dana Jacobs will be serving for the first time. 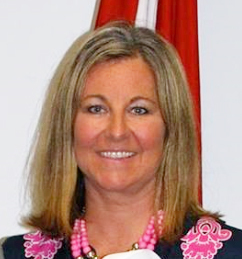 Rebecca Connelly is Past President from the 2013-2014 term. 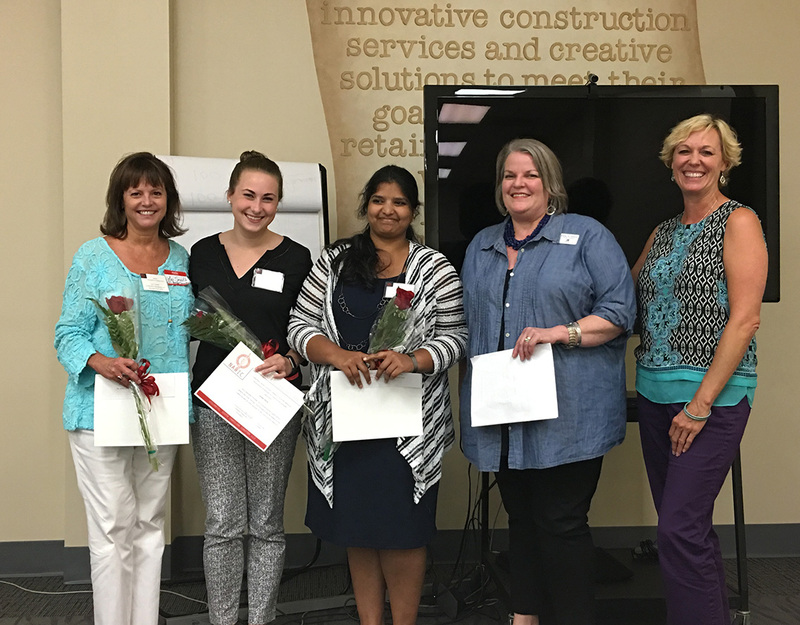 Three new members were inducted into NAWIC Columbia, SC, Chapter #113 at the member meeting on August 2, 2016. Pictured above (from left) are the three new inductees, Lee Smith of LJS Benefit Consultants, LLC; Jordan Hyrne of McCrory Construction; and Sravani Juluru of OLH; Membership Chairperson, Darla Moore of Hood Construction and co-chair Dana Jacobs of Sign-it-Quick. NAWIC Chapter #113 takes great pride in their ability to bestow scholarships to local students who are pursuing degrees in construction-related fields. 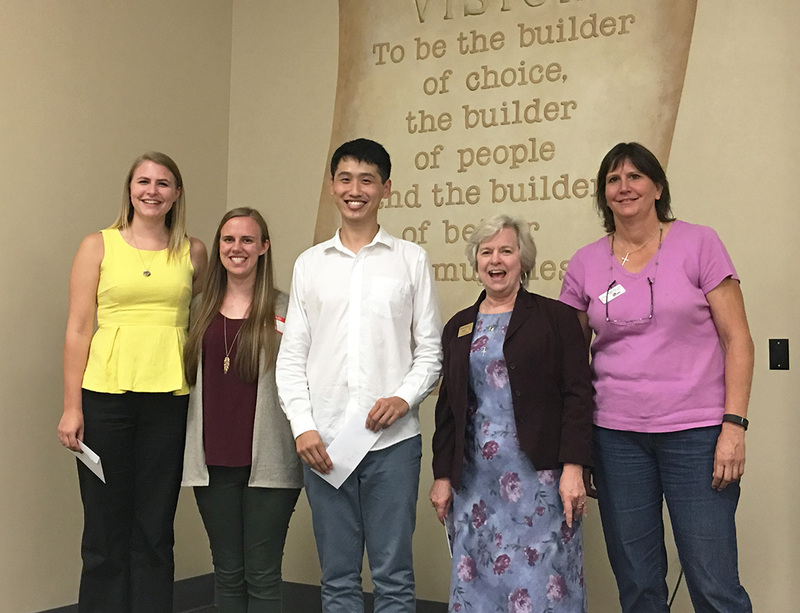 The Chapter’s representatives had the honor of presenting these scholarships funds to three students at the member meeting on Tuesday, August 2, 2016, at 6:00 PM. Pictured from left: Student recipients Karlee Sightler, USC; Amber Liebe, Anderson University; and Jian Huang, Clemson; NAWIC representatives Hilda Wynn of Premier Lighting and Control and Claire McLane of AOS Specialty Contractors, Inc. Recipients not pictured include Hobey Baughman, Midlands Technical College, and Addison Darr, USC. The scholarship program is supported entirely through voluntary contributions and/or funds raised by the members of the Columbia Chapter #113 and administered by the Scholarship Committee and the Chapter Board of Directors. The recipients are selected from applicants obtained through South Carolina-based high schools, colleges, universities, or technical/trade schools. The recipient(s) must attend a college, university or technical/trade school in South Carolina. Each applicant submits a fully completed application as furnished by the Chapter. Final selections are made by the Scholarship Committee. Please visit the website of NAWIC Columbia, SC, here to download the application. Click here for more information on Central South Carolina American Red Cross. 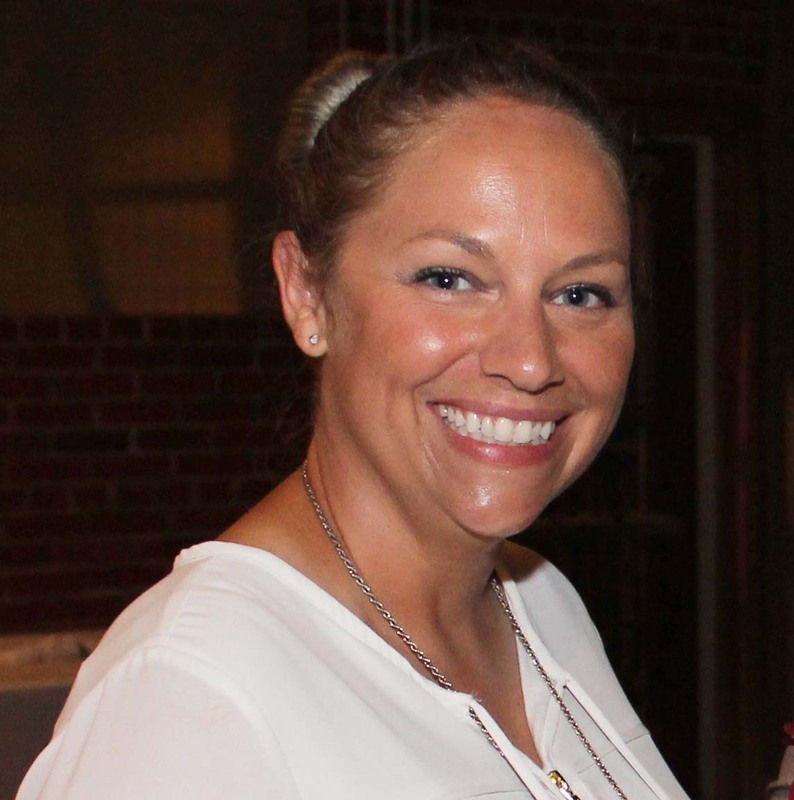 NAWIC Chapter #113 welcomes our very own Haley Ray, owner of Haley Ray Pavement Marking, as guest speaker at our August monthly member meeting. Haley realized the dream of starting her own company despite adversity. Years later, Haley is now able to help others who have experienced similar challenges. 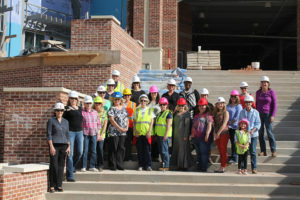 As a part of WIC Week activities, members and guests of NAWIC Columbia, SC, Chapter #113 toured the new Spirit Communications Park.